You are here: Home / How To Change Your Life / Are You Ready To Discover How Easy It Can Be, To Learn To Meditate? 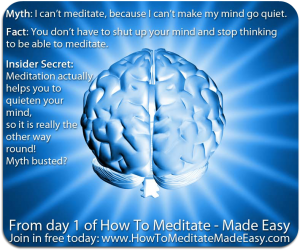 Are You Ready To Discover How Easy It Can Be, To Learn To Meditate? Isn’t It Time To Tame Your Monkey Mind? 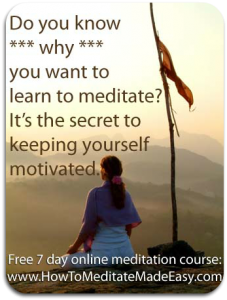 Do you want to learn how to meditate, but you’ve somehow never quite got round to it? Is life simply too hectic – and you’re not sure how to fit it in? Or perhaps you used to meditate, but you’ve lapsed and would like to give your meditation practice a kick start? Would you allow me to demystify the ancient techniques for you – and to blend them with inspiration from the world of modern psychology – to make learning to meditate easy for you? In just 7 days? In this 7 day free introductory meditation course, we’ll be laying the foundations, dispelling the myths and helping you to easily weave meditation into your daily life. It’s practical, light-hearted and really effective – and it’s a brilliant way to lay strong foundations for your meditation habit, when you’re starting out. If you’re looking to dive in more deeply, I do have a premium 90 day meditation course, too. Day 1: Myth-Busting And Excuse-Dumping! On Day 1 we’ll be covering what meditation is – and isn’t, busting the #1 myth (I bet you’re like I was – and it roped you in!) and getting started with your 10 minute MP3 meditation download. 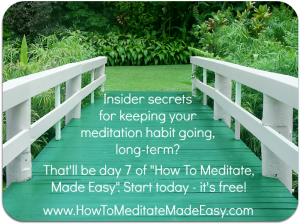 On Day 2, I’ll be sharing insider secrets on how to make meditation comfortable (it’s not supposed to hurt!) 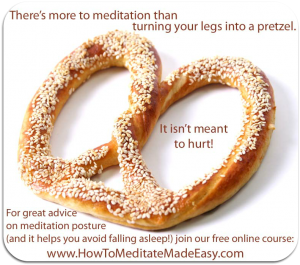 – and how to sit so you can meditate, without falling asleep – there’s a simple secret that really helps with this! Plus we’ll take a whistle-stop tour of the benefits you can look forward to from a regular meditation practice. Even 10 minutes a day can make a difference! On Day 3 I’m going to let you in on the secret to keeping yourself motivated – you won’t want to miss this! 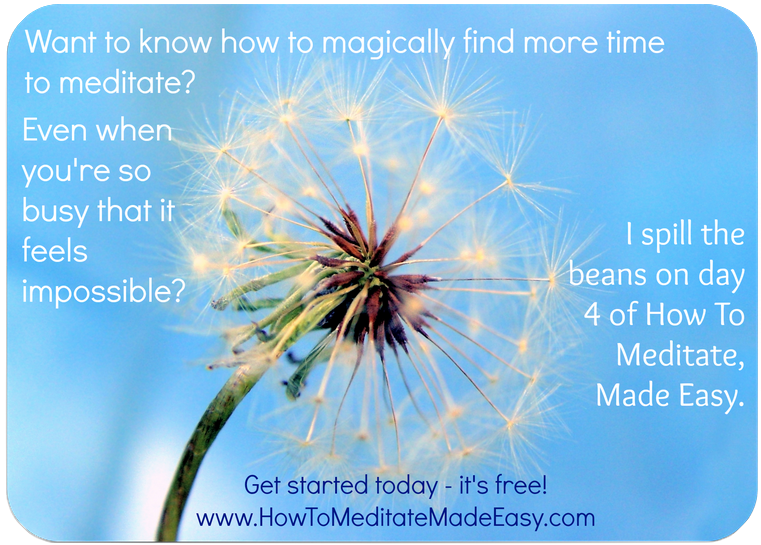 On Day 4 we’ll dive in and discover how to magically create the time to meditate, even when it feels impossible, no matter how busy you are, along with the best times to meditate. 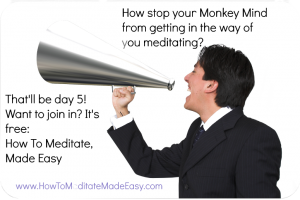 Day 5: How To Stop Your Monkey Mind From Getting In The Way Of Your Meditation? On Day 5 we’ll look at the tricks your Monkey Mind plays, to stop you from meditating, and how to get around them, and – vital – acknowledging that meditation can ‘stir the pot’ of your emotions – I’ll share with you a beautiful technique you can use as what I call ‘emotional first aid’. On Day 6 you’ll learn the little-known truths (that nobody tells you!) 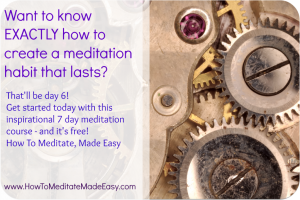 for turning an ‘occasional’ meditation into a habit you look forward to – for the 7 days and beyond – nuts and bolts and more! And on Day 7 you’ll create your own personal action plan for keeping the habit going – plus insider secrets to make it easy. Plus you get a gorgeous 10 minute MP3 meditation, which you can listen to, each day, and moral support in our lovely invitation-only Soul-Sized Living online community. And you also get my weekly Soul-Sized Living updates, with the latest Soul-Sized Wednesdays life-changing video, plus exclusive articles and members-only treats. I have been there and done it – both as a student of meditation for over 20 years and, over the past six years, as a formally qualified meditation teacher (and NLP Trainer and reformed Mechanical Engineer and author and busy mum of 3 young boys) – so I know ALL ABOUT meditation excuses 😉 ! I can help you find the short cuts you’re looking for – and I’ll be sharing the insider secrets that make it simple and fun. My students tell me that this stuff works – ten minutes a day really can change your life. Oh, and, err… did I mention… I’m giving this to you as my gift? No strings. No catches. Just a heart-felt desire to help you change your life. If you’d like to be part of this, then register today – it’s free – as my gift to you and your future. See you on the other side of the sign up form!